Our made-from-scratch Parmesan Black Pepper Dressing is super rich while also being a great alternative for classic Caesar dressing. Stir together yogurt and mayonnaise in a medium bowl. 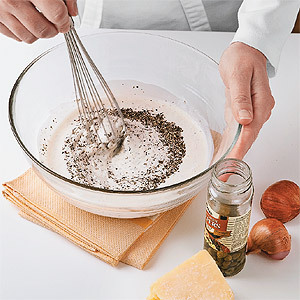 Whisk vinegar into yogurt mixture until smooth. Stir in Parmesan, shallots, pepper, capers, horseradish, and salt. Whisk again before drizzling dressing over salads. Refrigerate any leftover dressing in a covered container for up to 1 week. Craving a BLT but worried it's not healthy? Try this salad version to bump up nutrition without compromising taste.